This is what I did most of last week. It was a great week for winter sunbathing in Washington state. Really! This is me in Ilwaco. We usually go there to buy seafood! I am so excited! It has been a very long time since I had a chance to go to THE BEACH! I’ve been to the Long Beach Peninsula before and have fond memories of resting on a window seat when it was storming outside, romping on the beach chasing seagulls and having some seafood added to my dinner. Here's The Breakers Resort. Notice the Path to the Beach. So I was thrilled to learn that we are headed to the beach tomorrow. We are staying at a new place for us, a pet-friendly place of course. It is called The Breakers and it sounds great. Lots of room to roam and lovely condos. It’s only a mile from downtown Long Beach. We could easily walk there via the Discovery Trail. Look, my name is on the reservation! So now I am packing. Although I hate wearing my rain coat, I guess I’ll pack that. I hear it will rain for the next couple of days. (There are always breaks in the weather). So I’ll take some bedding, my food, my long leash, and a bowl for the food and, if I am lucky, some treats. I hope we have room for treats! Many of you have wondered why I haven't written much lately. And my Facebook friends have suggested that I TELL ALL! Well, first of all, because my owner has been going on walking tours of historic areas of Portland (way across the bridge from here), I've been having to get up really early. I love sleeping in. But several mornings this week I have had to be up and outside by 8 AM! Imagine! I have to get up, go outside and then can't go back to bed in my warm house because SHE IS LEAVING! So I am fed an early breakfast and have to go in the garage to stay while she is gone. 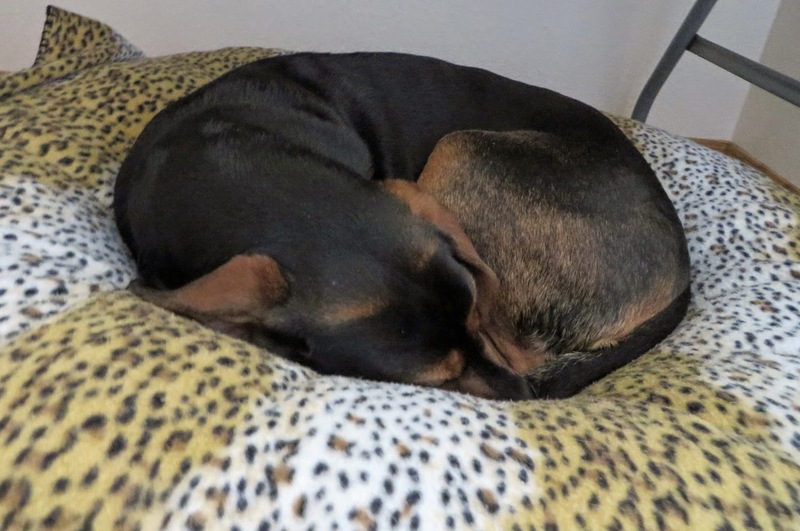 I do have my old bed in the garage, so I usually just sleep the hours away. So today, Sunday, I am sleeping in as long AS I WANT TO! See my magnificent coonie ball? Nobody better bother me until I, Cinnamon, am ready to get up. 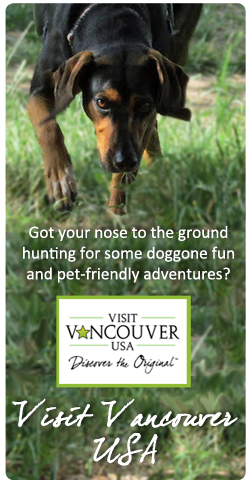 Notice that there are NO dogs on this walking tour. And if that wasn't enough, she had to celebrate Chinese New Year by going to the Lan Su Chinese Garden with her photography friends. They don't allow dogs there either. 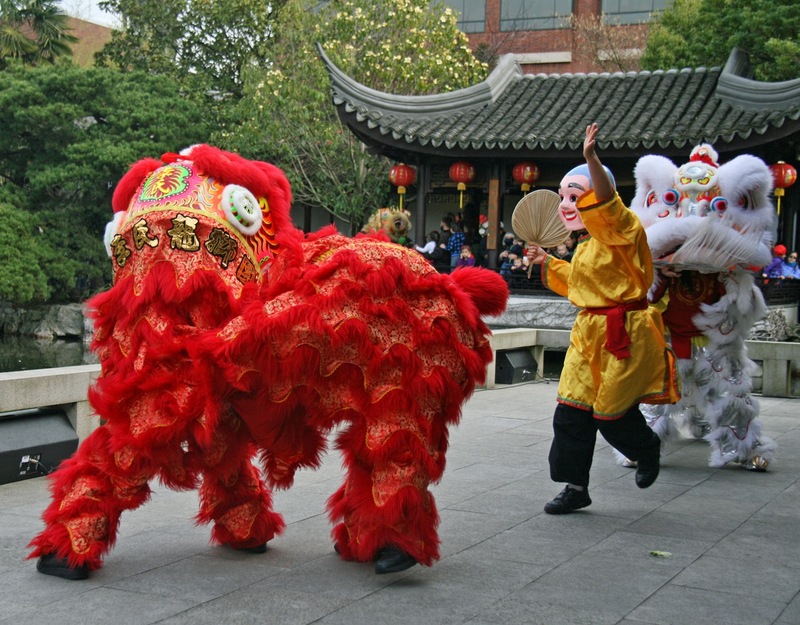 She had a great time, saw the Lion Dancers and went out for Chinese food. All the while I was locked in the garage with a bowl of water. IMAGINE! And the celebration went on. One night after I had dinner, she took off and went out to a Chinese restaurant for more celebrating. AND LEFT ME ALL ALONE! Here's the Lion Dancers. I would have had fun chasing them! So now it is Sunday and she is FINALLY STAYING HOME! I slept in and will have a leisurely breakfast. I think I'll laze in the sun on the deck because I don't have to go in the garage today. YAY! See what a week I have had. That's no way to treat a dog, right? 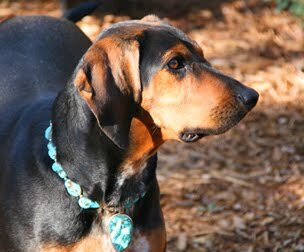 Wordless Wednesday: Coonhounds - Best of Show! So a beagle won. Score one for the hounds. But I, and my coonie friends, are worthy of best of show too! Here I am at the nursing home being the center of attention. I always thought I should be a therapy dog. 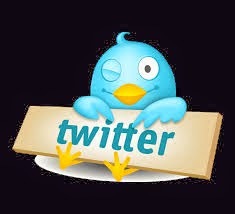 I love people and they love me. And I especially love people in wheel chairs because they are at my level and like to reach out and pet me. So Sunday I had quite an adventure and a taste of what it might be like to be a therapy dog. I do get tired of chasing squirrels and would like to do some volunteer work. 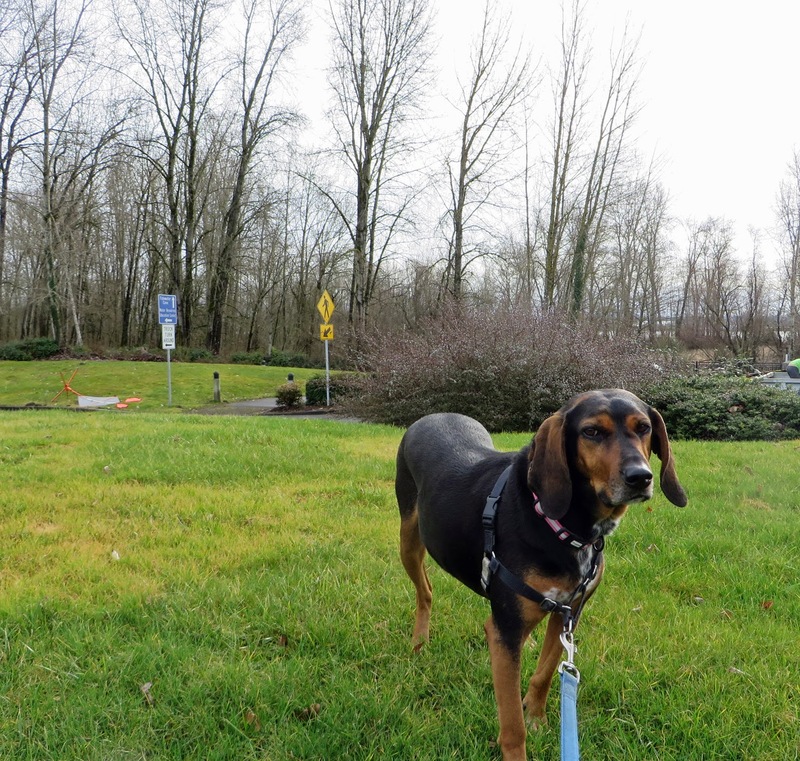 We were headed out for a walk on a really sunny day but first my owner wanted to see our friends at a nursing home in Salmon Creek, right near the walk. I was told to stay in the car, in the shade, and so I settled in for a nap while she visited with George and his wife. I was kind of sad because I really like them, especially when they come to parties at my house. George was stuck at the nursing home having PT so he could get stronger and go home. So, anyway, my owner was gone for awhile. All of as sudden my owner came back, unlocked the car door and GOT ME! I WAS GOING TO GO INSIDE AND VISIT! Yay! I trotted right up to the door and went up to the desk. We had to fill out some papers. Then something good happened. THE LADY HAD TREATS IN HER DESK DRAWER AND GAVE ME ONE! Score! This was getting good. As soon as I went inside, people started petting me and telling me about their dogs. I brought smiles to their faces and that made me feel really good. Therapy Dog Cinnamon.... it has a nice ring to it! So we went past the nurses station and the staff got all excited and wanted to pet me. This was why it was taking a long time to find my friend George. Finally we found George and his wife and started visiting. 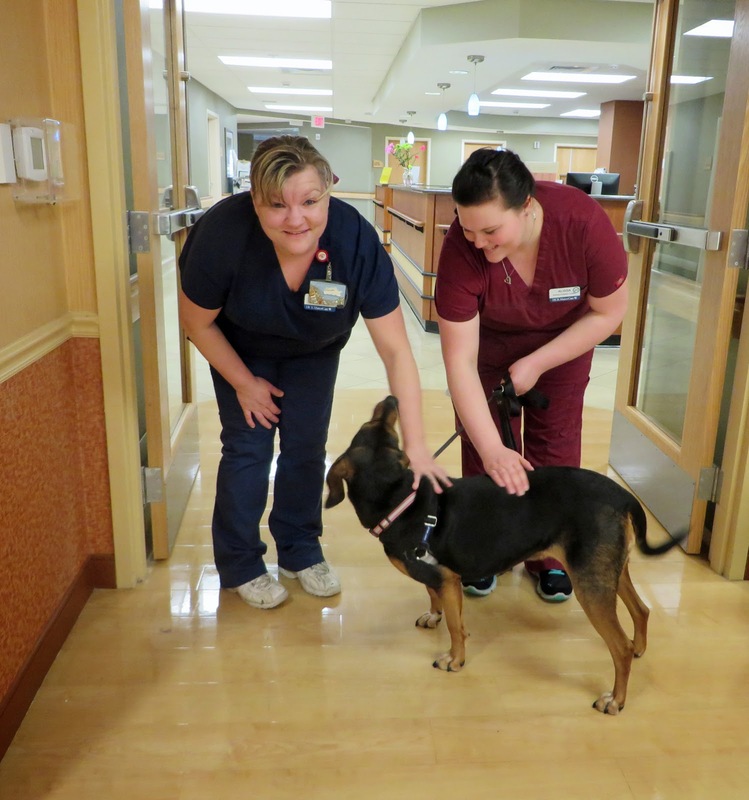 People who were patients asked to pet me. Then my owner and our friends started talking. Yack, yack, yack. I got sleepy waiting and almost fell asleep on my feet! It was pretty quiet there... not a lot going on. I suppose I was the best thing that had happened that day! We visited and visited and then it was time to leave. I hope George will be home soon because I really like his neighborhood and want to visit him there. I think he'd be happier there too. Maybe we could have coffee at Mon Ami? So we took off and went for the walk. I actually liked my visit to the nursing home. I might do that again! Wordless Wednesday: Woo Hoo! 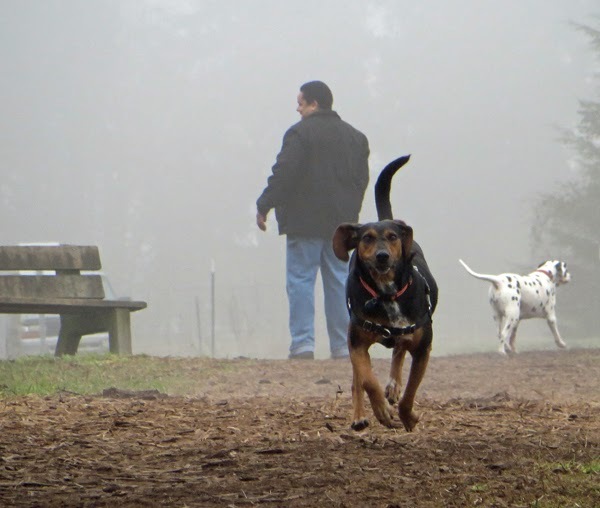 My Dog Park is Re-opening Sunday! It has been closed all too long. Sweet Valentines Day Video Made Me go AWWWWW! By now you know I am a fan of dogIDs. But I also have a sentimental side. This video brought a little tear to my big brown eye. See if you feel the same way. I'm not one to stick around home if the door or gate is open. I love to explore! So my over-protective owner buys identification collars from www.dogids.com . 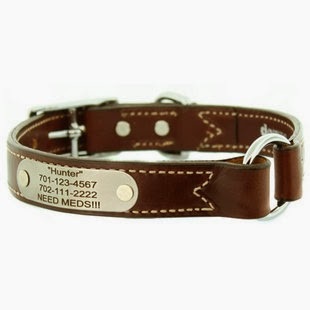 dogIDs has a range of tags, collars and more, all with personalization offered. I've been wearing their reflective collars with my name and phone number embroidered on them since the first time I slipped out of the back gate in Santa Fe. Since my owner loves me, she decided, a couple of years ago, to order a beautiful leather collar. And it had a metal plate where she had my name, home town and phone number engraved. I loved it and only wore it for special occasions like going to see the Budweisder Clydesdales and for parties. So late last year we moved. We had a new address and new phone number! My dress collar, still in perfect condition, had the wrong phone number on it. What to do? WHAT TO DO? Fortunately for me dogIDs offers new plates for those collars for ONLY $5.00! That including shipping the collar and new plate back after they replaced it. 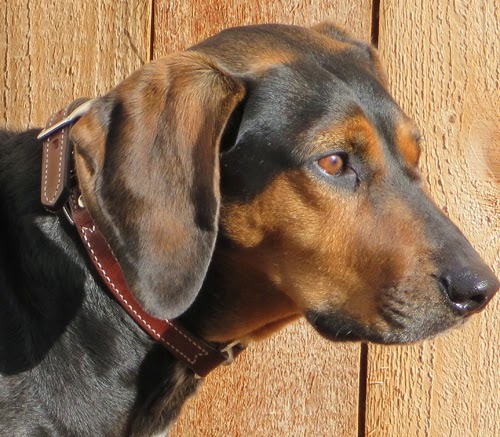 So, of course, we shipped my beautiful leather collar off to them for an update. And it came back FAST! engraved plate with my name and new phone number on it! So now, when I want to dress up, look really upscale, or otherwise impress everyone, I have a collar for the occasion. And, to be safe, I have the right phone number engraved on it! Looking beautiful in my leather collar. Keep safe while looking gorgeous. 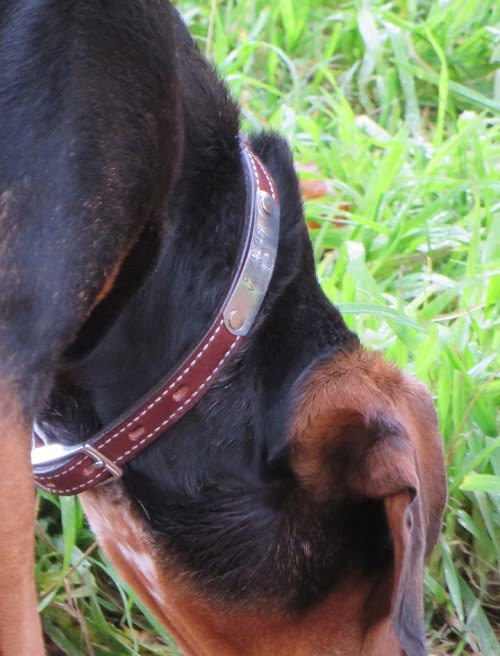 Try out identification collars from www.dogids.com .Their customer service is tops! 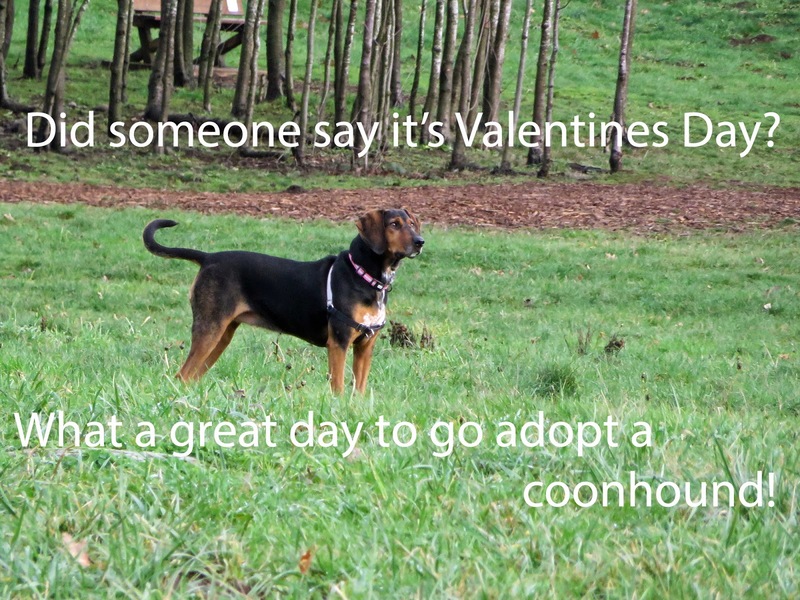 What Does a Coonhound Want for Valentine's Day? Valentine's Day is coming up and since I am so sweet, I'll bet I get some Valentines! Now cards are nice and flowers are nice (chocolate is poison) so I thought I'd better get my wishes out there so my Valentine's Day is a really good one. 1. 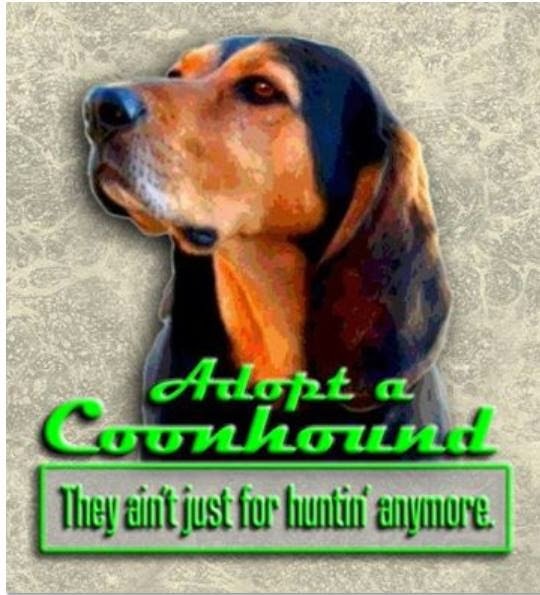 I want that all coonhounds have a warm, loving home with food, toys and a soft bed or sofa. 2. I would like my bench back! Or, at least an old couch on the back porch. I had my bench re-painted and then my owner put it on the front porch where I can't use it to relax on. I have to sleep IN THE DIRT in the back yard when I want to take a rest outside. 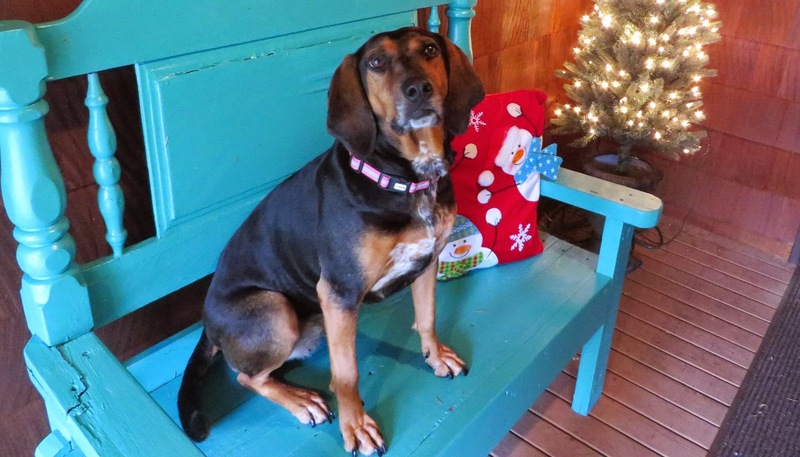 Here I am on MY bench but only for a Christmas picture. Unfair! 3. I would like some really good food like salmon, steak or a hot dog (even though they make me sick). 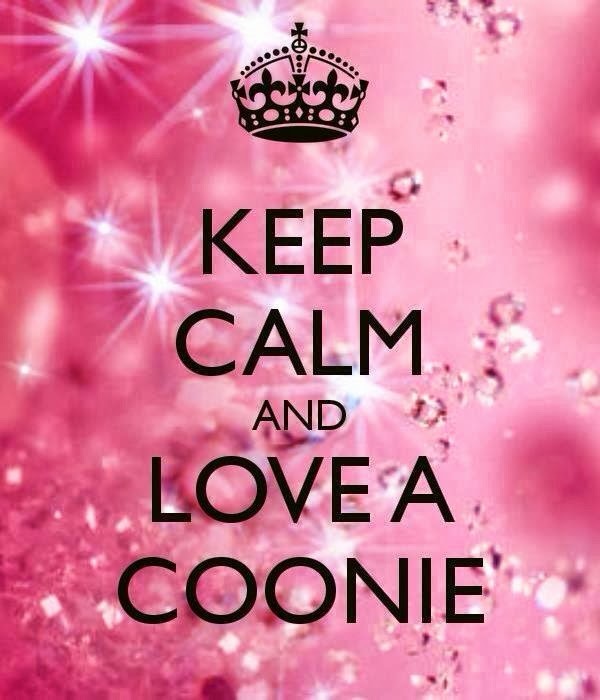 Treats are the way to this coonie's heart on Valentine's Day and any day! If you love me, you'll give me a big treat on Valentine's Day! Love, Cinnamon, the Valentine's Dog! 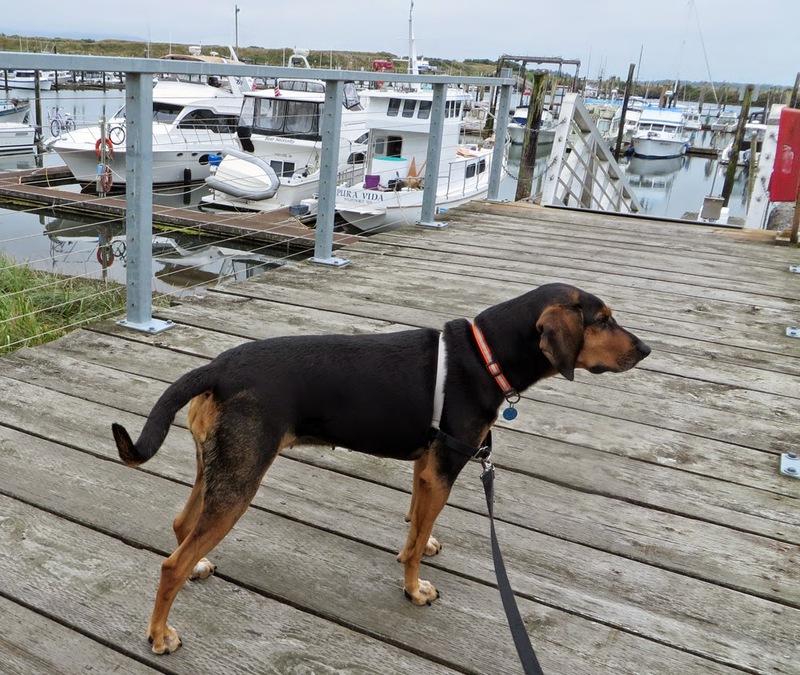 Wordless Wednesday: Did anyone say Squirrel? When you want me to look alert, just say the word "Squirrel!" 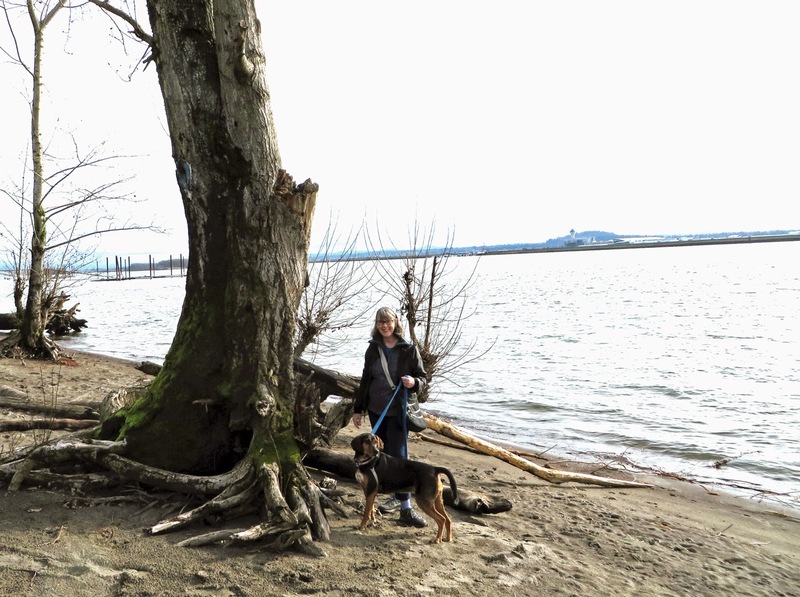 Vancouver, Washington Renaissance Trail: Tidewater Cove Open Again! Here I am waiting to start the walk. I was so excited. 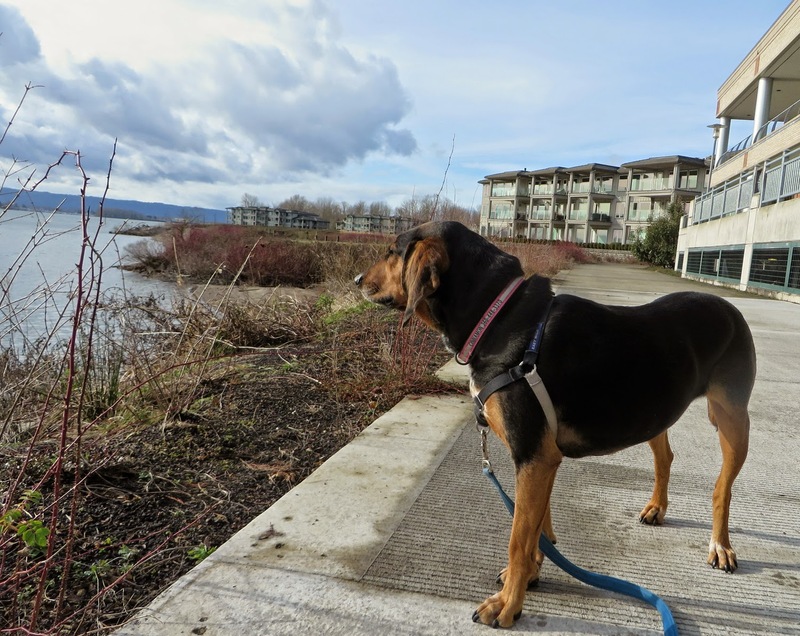 Today we were going to walk on the newly re-opened Tidewater Cove section of the Vancouver Renaissance Trail. Last time I was there, the trail was still closed. I looked at the storm damage and wondered if it ever would open again. But today, the new, wide, concrete trail was OPEN. We walked with our friend Walking Wendy and the rainclouds parted for us. We started our walk at the Vancouver Water Resources Education Center. There were some kids from the Battle Ground Schools cleaning up the trail (just for me, right?). We kept walking past the kids (they all thought I was cute!) and headed out on the new section right along the Columbia River. That was the Tidewater Cove part. 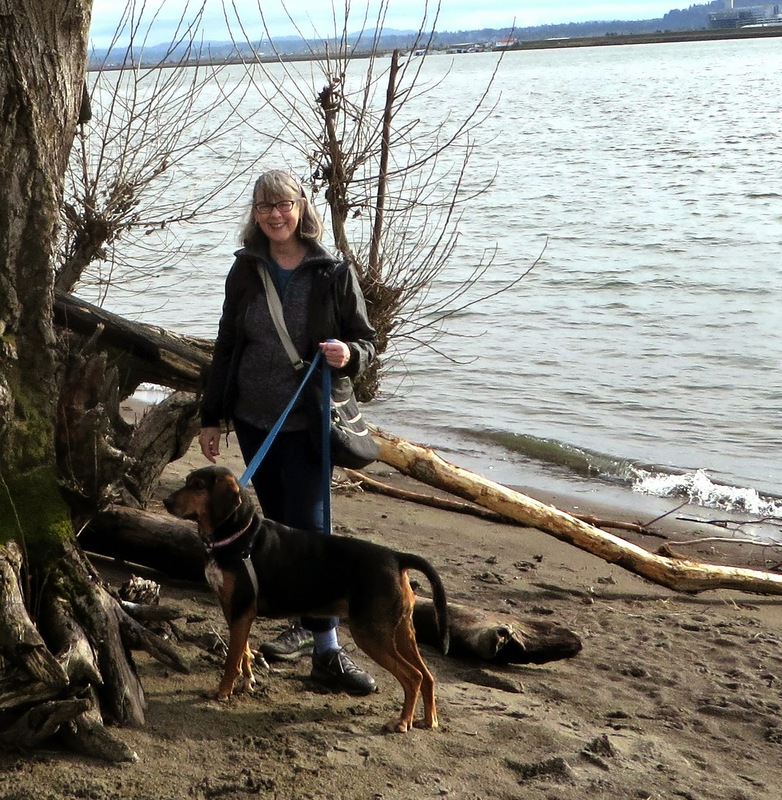 There were new plantings and new rocks shoring up the land leading to the Mighty Columbia River. Hre I am on the new part of the trail. We walked along and went out on the point where Kelley's Bench is. I didn't rest on it this time but I considered taking a break because the sun was coming out. It was actually warm. Then we kept walking to the end of the trail. I got to go on the beach by the river and sniff around. We hiked along the beach and then back up to the paved trail. It was a beautiful day. The humans complained that the restrooms weren't open but that didn't bother me one little bit! Any kind of a beach is a good beach in my book! I was just happy to have MORE TRAIL along the river.